Shipping estimates are shown in the shopping cart for items that can be calculated (future release items do not have size or weight information yet, and cannot be calculated). Shipping costs for orders will also be shown during the checkout process, and also in your Private Warehouse for items that you have already paid for and want to group together. Again, you can easily check shipping estimates by putting items in your shopping cart. There is no need to complete checkout to see these estimates. Please note that the estimates will be for all calculable items in the Shopping Cart, whether they are in stock or not, and that the estimate will not include items that do not have size or weight information (future releases). You will see the final definitive shipping costs (not estimates) for shippable items once you enter the checkout process. The rates shown on the web site are not necessarily a direct quote of postal service or courier charges, per se, but rather the rates charged by HobbyLink Japan to you to effect delivery of your package. These rates reflect not only the shipping fees we pay (which may be discounted by service providers because of our volume), but handling charges and packaging costs, too. The Standard International Registered Shipping (Registered SAL) rate shown is the cost to ship the item via standard postal service shipping methods, as above, but with your package having been registered with the postal service at a cost of 410 yen. The package is insured for up to 6, 000 yen without any additional cost. The registration number has limited tracking capability. Real-time tracking is not provided, and up to 3 weeks may be required for the tracking record to become available. Tracking is available for these destinations only: Belgium, China, Croatia, Estonia, France, Hong Kong, Indonesia, Ireland, Luxembourg, Netherlands, New Zealand, Singapore, Slovakia, Spain, Sweden, Switzerland, and, currently in a trial period, Argentina, Egypt, United Kingdom (UK), and United States of America (USA). 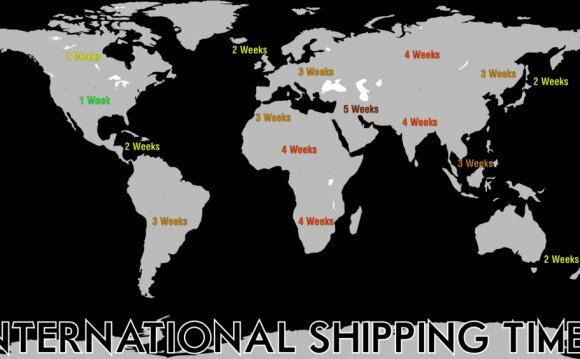 These countries are able to receive Registered SAL shipments: Algeria, Andorra, Argentina, Armenia, Azerbaijan, Bahrain, Bangladesh, Belarus, Belgium, Brazil, Canada, Chile, China, Colombia, Croatia, Czechoslovakia, Egypt, Estonia, France, Georgia, Gibraltar, Greece, Guam, Hong Kong, Kuril Islands, Iceland, India, Indonesia, Ireland, Israel, Italy, Kazakhstan, Kenya, Kuwait, Kyrgyzstan, Latvia, Liechtenstein, Lithuania, Luxembourg, Malaysia, Malta, Marshall Islands, Mexico, Micronesia, Midway Islands, Monaco, Montenegro, Netherlands, New Zealand, Pakistan, Palau, Peru, Philippines, Portugal, Puerto Rico, Russia, Saint Pierre and Miquelon, San Marino, Saudi Arabia, Singapore, Slovakia, Slovenia, South Africa, Spain, Sri Lanka, Sweden, Switzerland, Tajikistan, Thailand, Turkey, Turkmenistan, Ukraine, United Arab Emirates (UAE), UK, USA, Uzbekistan, Vatican City, Virgin Islands, and Wake Island. Countries not able to receive Registered SAL shipments are Australia, Balearic Islands, Ceuta, Chafarinas Islands, Denmark, Finland, Germany, Greenland, Hungary, Jadu, Kosovo, Melilla, Moldova, Northern Mariana Islands, Norway, Paraguay, Poland, Saipan, and Serbia. The Express International Shipping (EMS) rate shown is the cost to ship the item via the postal service's express methods, typically "EMS" international express mail. Shipments by EMS can be tracked on the Japanese post office's web site. NOTE: EMS cannot ship to APO/FPO military addresses. The Express International Courier (FedEx) rate shown is the estimated cost to ship the item via Federal Express International Economy (or if not available to that country, International Priority) service. If FedEx service is not available to your country, DHL may be substituted (but is not choosable). Helpful Hint: Unlike the post office, FedEx shipping fees are calculated by volume, not weight. This makes them particularly reasonable for small, heavy packages, like books, and for very large, bulky shipments when compared to the post office. Be sure to compare estimates. Shipments by FedEx can be tracked on FedEx's web site. NOTE: FedEx cannot ship to PO Box, APO, FPO or other military addresses. CUSTOMERS IN EUROPE: Please be aware that FedEx may charge a customs handling fee, and that your country's Customs Office will probably charge separate import fees and taxes. These may come as a bill arriving a week or more after you receive your package. For all shipping methods there may also be fees charged by other organizations working with your country's post office. You are responsible for paying these fees. CUSTOMERS IN CANADA, MEXICO & SOUTH AMERICA: Please be aware that your country's Customs Office and/or your local FedEx office may require special handling fees in addition to customs fees for imported items, which may be charged prior to or after delivery. You are responsible for paying these fees. Mexican Customs may require something called a "Sanitary Permit, " which must be obtained and provided by you. CUSTOMERS IN THE USA: Please be aware that the US Customs Office may require a TSCA form or other documentation from you for shipments including ink or some non-toxic paints (such as Gundam Markers). Customs will supply the documents and instructions on how to fill them out, and there is no charge. Please be aware that in all cases you are responsible for paying customs fees and for providing any and all documents required by Customs; failure to pay fees or provide documents may result in the package being sent back to us, with additional fees and charges being billed to you. CUSTOMERS IN JAPAN: We will ship your order by Kuroneko Yamato's "Takkyubin" service. Up to 2kg, the cost is 600 - 1, 000 yen, with next-day delivery to almost all destinations in Japan. NOTE: Yamato cannot ship to APO/FPO addresses. When you choose Private Warehouse during checkout, those items will be charged and moved to your Private Warehouse. You can then combine or split orders as you please and have them shipped at your discretion. You will be charged for the shipping at that time. As stated above, items will automatically be shipped if they are left in your Private Warehouse for over two months (you will be notified by email prior to any such shipments). You can use My Account to track the status of your orders with us, and make a decision at any time about whether you want to request a shipment from your Private Warehouse.